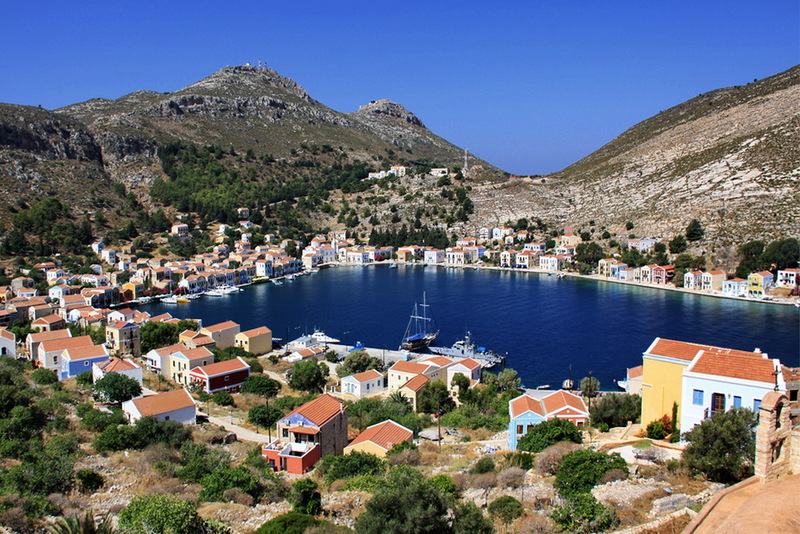 Kastelorizo (officially Megisti) is a Greek island located in the southeastern Mediterranean. 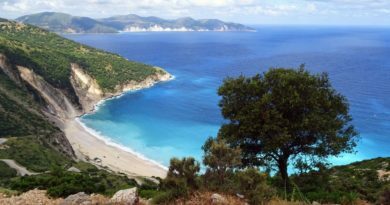 It lies roughly 2 km off the south coast of Turkey, and 125 km east of Rhodes, almost halfway between Rhodes and Antalya. 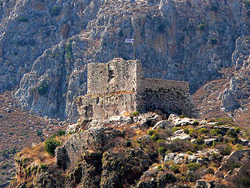 Kastelorizo is part of the Rhodes region. 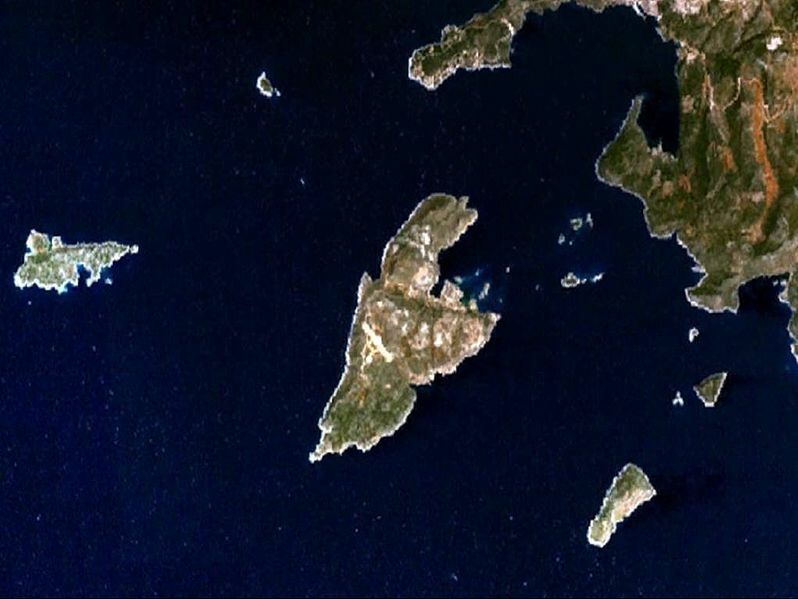 The meaning of its current official name Megisti is “biggest” or “greatest”, but it is the smallest of the Dodecanese. 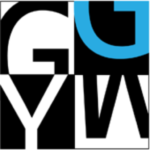 The name, however, refers to the fact that it is the largest of the small archipelago. 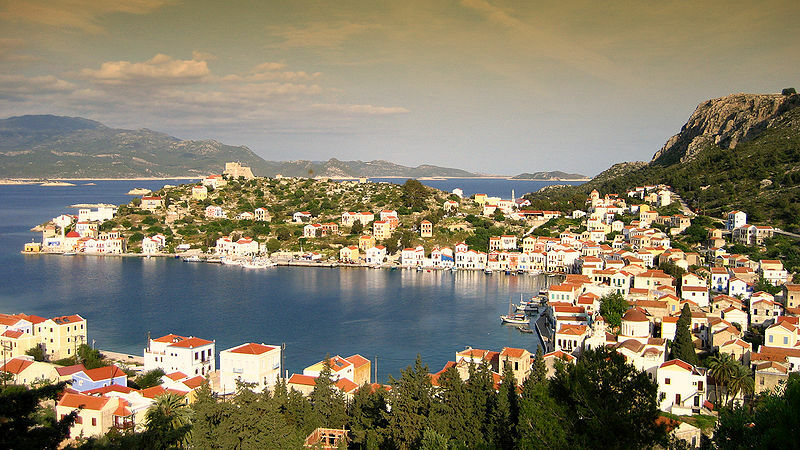 Kastelorizo is (with the exception of the nearby islet of Strongyli) the easternmost Greek island and is situated in the Eastern Mediterranean. It is six kilometers long and three kilometers wide, with a surface of 9.2 km². It has a triangular shape, and is oriented from NE to SW. 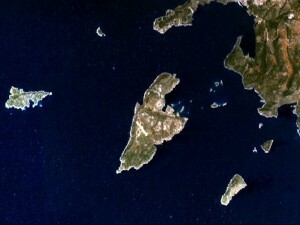 The island features three capes: Agios Stefanos (north), Nifti (east) and Pounenti (south west); between the first two there is a wide and accommodating bay, the island’s main harbor, where one finds the only town on the island. The houses of the town are slender and characterised by wooden balconies and windows of the Anatolian type. Behind the waterfront, many houses are still in a ruinous state. At the entrance to the harbour, on the east side, stand the single story remnants of the former Italian governate, erected in 1926 by the Italian architect Florestano Di Fausto, who also designed some of the most important buildings of the Italian period in Rhodes. Nearby is the island’s former Ottoman mosque which dates from the second half of the 18th century and which has been now restored and re-opened as a museum (2007). From here starts the town’s quay, which runs along all three sides of the harbour. The central square —Plateia Ethelondon Kastellórizou—lies at the mid-point of the eastern side, near the vessel dock. On the opposite side of the harbour one has a good view from this vantage of Pera Meria, the western quay, and the monasteries of Profitis Elías and Aghia Triadha, the former now an army base. Blue Cave is the most celebrated attraction of the Greek island of Kastelorizo. The cave lies on the south-east coast of the island, and is named by the inhabitants phokiali (Greek for seal’s refuge). Being 40–50 m long, 25–30 m wide, and 20–25 m high, it is much larger than the world famous Grotta Azzurra on Capri, Italy. 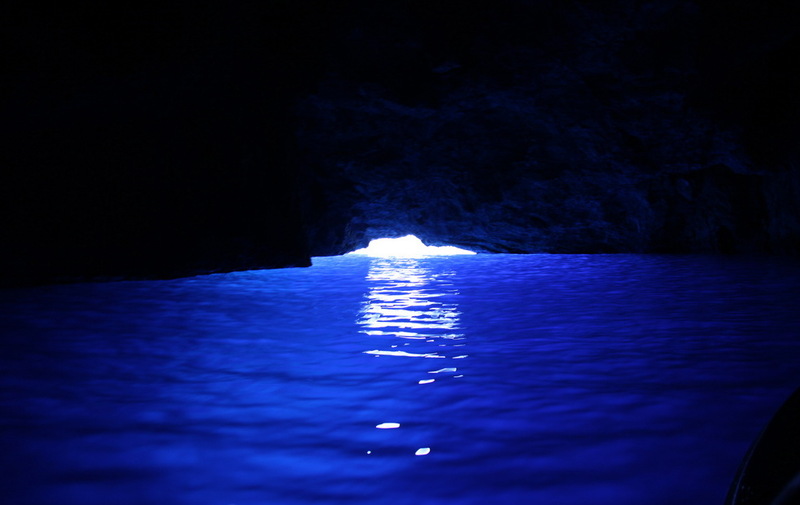 The light of the sun, refracted through the sea, is reflected in the interior of the Grotto, thereby producing a dazzling blue colour. The Cave can be visited only by boat and, since the entrance is barely one metre high above sea level, only under calm sea conditions: the best time of the day to visit is early in the morning, when the sun is still low. The Castle of the Knights: Above the quay on the eastern side there is a pathway which leads to the Castle of the Knights, built in the 14th century on the edge of a small slope on a reddish rock (Castello Rosso) from which the island got its name. Of it remain the curtain wall, part of a square tower, the remains of a cylindrical tower at the east corner, and toward the sea another cylindrical tower. A Doric inscription, carved in the rock, attests to the existence of an earlier fortress here during Antiquity. Inside the tower there is a large covered cistern. The Archaeological Museum is located close to the remains of the castle and it has exhibits of great value from different periods as well as objects of folk art. 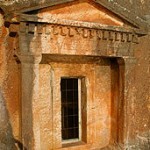 The Stone-hewed Lycean Tomb is a perfectly preserved tomb of the 4th century B.C. hewed in the stone at the foot of the Castle. It is worth mentioning that Lyceans was the name given to the inhabitants of Asia Minor because they worshipped “Apollo Lycios” where “lycos” is the Greek word for “wolf”. 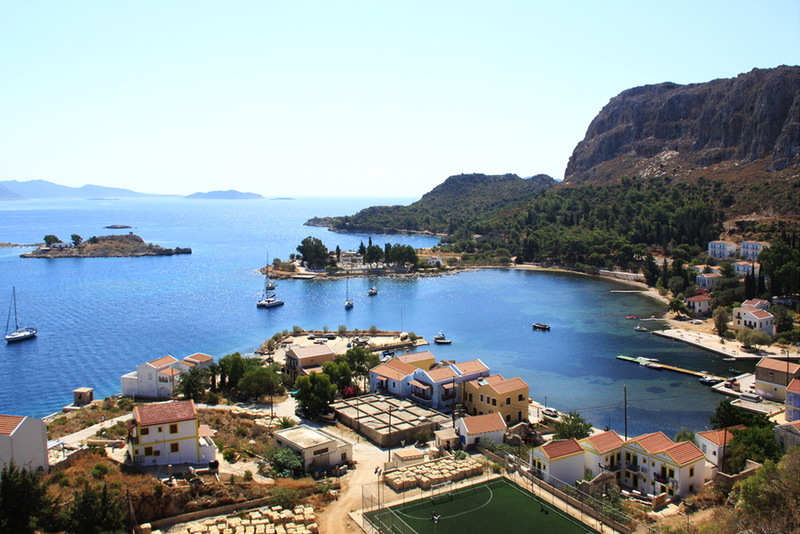 Palaiokastro: On the western side of Kastelorizo is the most ancient and important sight of the island – Palaiokastro. It is an ancient settlement with a lot of remains of buildings and water cisterns. On its Doric Acropolis of the 3rd century B.C. there is an inscription that mentions the name of Megisti. In the same area, in the location of Limenari, there are remains of the Cyclopian Walls. The Monastery of St. George “Tou Vounou”, meaning “of the Mountain“: Having walked along the cobbled lanes of the port, it is worth walking up the 401 steps that lead to the monastery of St. George Tou Vounou. 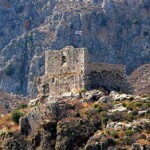 It is situated in the area of Palaiokastro and enormous natural stones surround it. 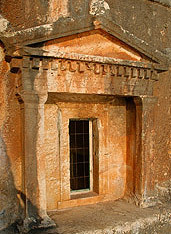 Inside the monastery there is a catacomb, St. Charalambos. 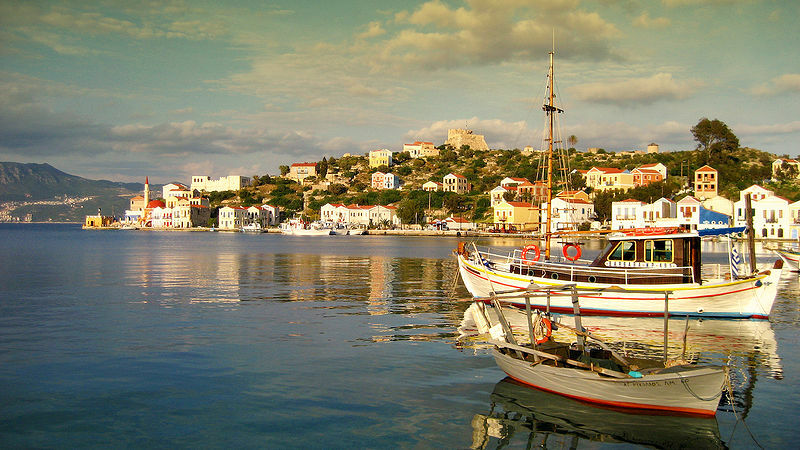 Islets around Kastelorizo: Located on the south-west side of the island is the islet of Ro that you can only visit by boat. Well known for its ‘Lady of Ro” who was its only inhabitant, and who for decades rose the Greek flag every morning. Still, you may visit the islet of Stroggili on which is the nautical lighthouse – the island’s only inhabitants are its lighthouse keepers. Both islets (Ro and Stroggili) offer crystal clear waters and are ideal for a swim.